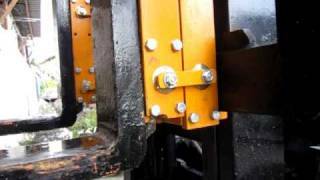 SEKO weighing modules installed on forklift carriage with no modifications needed. 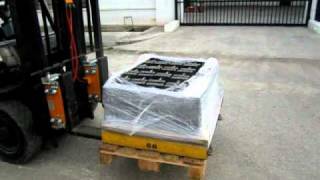 SEKO Forklift weigh modules- extremely easy to install. 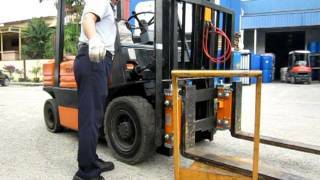 Simple latch on design enables hook on to carriage and no modification needed on the forklift. The system can weigh accurately even though mast tilt between 8 degree backward to 8 degree forward. The system can weigh accurately through mast tilt between 8 degree backward to 8 degree forward. First weighing was done at the forks tip (1087kg). Second weighing done at fork rear, still showing 1087kg. SEKO design shown no variation between loading at the fork tip and the forks rear. The accuracy can be maintained permanently without adjustment required. This forklift scale replaced the flexure with the solid mechanical linkage. 1. 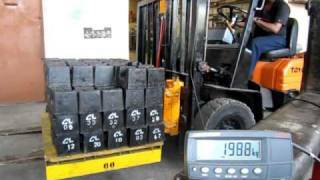 Test of sensitivity by adding 1kg on the load of 2,000kg. 3. Test of weight accuracy when mast is tilted at different angle. 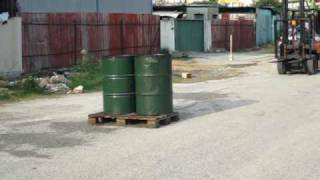 In house impact performance test - The forklift had a head on impact with two steel drums filled with water. The weighing scale remain accurate after the impact test. A forklift installed with SEKO forklift scale. 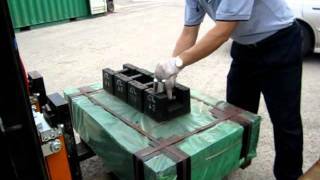 1 The weight of the pallet, 1087 kg, can be read directly when it was lifted. 2 The pallet was unloaded and the forklift reversed to a distance of 40 metres. 3 A piece of wood was place in front of the pallet. 4 The forklift moved in at high speed and hit the wood to simulate a typical impact in normal weighing operation. 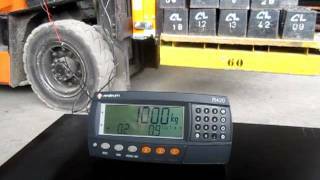 5 After the impact, the scale is still able to weigh the pallet accurately at 1087 kg. 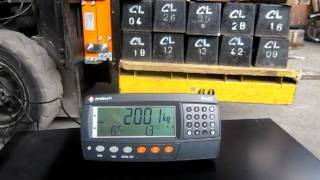 Atlas Weighing Systems - CompuLoad Scales using SEKO Forklift Scale weigh modules.